Admittedly, I went to Hinodeya Ramen because I fell victim to the “long line trap”, or as my friend Stephen says on his blog SF Waits: “Is that a line? Let’s go wait in it!” San Franciscans are enamored with restaurants with long lines, which dangle the alluring promise of a meal worth waiting 1 or 2 hours for. Hinodeya Ramen (House Ramen) with traditional Japanese dashi style soup & whole wheat noodles soup made from bonito,kombu & scallop. I lead culinary walking tours at least once a month in Japantown for Gourmet Walks. At the end of my food tour, I take my tour through Buchanan Mall in Japantown. When I returned to San Francisco after my summer working in Copenhagen, I noticed that this ramen shop on the mall had a cue as early as 4:30. There are two things to note: 1) There are dozens of ramen shops in Japantown 2) This place doesn’t even open until 5pm. Was I crazy to think that this would be some of the best ramen of my life? Probably. But in the name of food research, I knew that I need to slurp this ramen and see for myself if the ramen here warranted the lines. At Hinodeya, the dashi broths made of bonito skipjack tuna (katsuo) and konbu seaweed delivered a deep umami flavor. 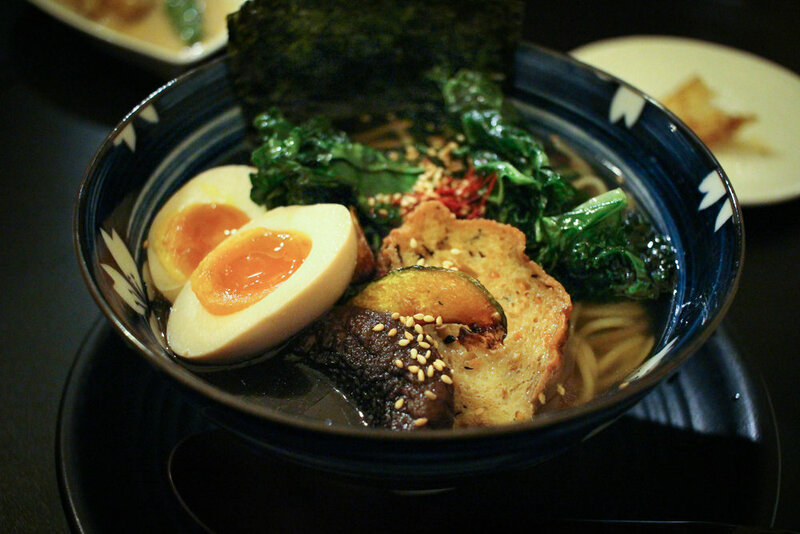 The veggie ramen here was also on point, and they definitely nailed the soft cooked egg. Most importantly, however, we ended up not needing to wait in line. In short, there are several other ramen places that I would rank higher: Ken Ken Ramen, The Ramen Shop, and Coco’s Ramen, just to name a few. However, for a cozy meal in the middle of Japantown, this is a great spot to relax, eat some body-warming soup, and catch up with friends. Tori Paitan (Chicken Ramen) with rich chicken and dashi broth & whole wheat noodles. Toppings: braised wing, shitake mushroom,dried seaweed, softcooked marinadeegg, dried seaweed & green onion. Veggie Ramen with tofu veg cake, bell pepper, fried kale, acorn squash, shitake mushroom, green onion and a soft-boiled egg.